Beginning October 15, 2013, articles will not only be available to read, but also to listen to in new audio editions of the Journal and the Sentinel. All JSH-Online subscribers will be able to stream the audio editions beginning with issues from January 2013, and, when possible, articles will be read by the original writer. For issues published in the last 90 days, subscribers will have the option to download each audio piece. For any individual who does not subscribe, or would like to purchase audio outside of the 90-day window, the audio editions can be purchased in The Christian Science Publishing Society’s online shop. A headphones icon ( ) will be featured on the Table of Contents page of each issue as well as on article pages. Clicking this icon launches an audio player, where you can easily listen to the articles being read. This is an excellent way to “read” your magazine while on a walk, cooking, commuting, or simply taking a quiet moment at home or work. This audio feature adds another layer of accessibility for subscribers who are less comfortable with reading on a computer screen. After months of preparation and coordination with the many writers published in the Journal and the Sentinel, we expect that readers and listeners will benefit from the new audio format. The audio recordings of the Journal and Sentinel articles will appear as “listen” links on JSH-Online next to the printed version of each article. As such, they will be available to subscribers of that product. They will also be available separately as a download offering so that people can listen to an entire issue on the go if they wish. But gratitude isn’t a payoff—the reward we give back to God for bestowing on us the result we’re expecting. Rather, it’s our prayerful acknowledgment that good is always present, available, and uninterrupted. Isn’t that a sweet place to start with every prayer? 3) End. Thinking of prayer in humanly reasoned terms, we pray first … see a result … and then give thanks. But if we follow Jesus’ example in the Bible—for instance, when he prayed to God before Lazarus was raised from the dead: “Father, I thank thee that thou hast heard me. And I knew that thou hearest me always” (John 11:41, 42)—we acknowledge that, from an entirely spiritual viewpoint, there is nothing to heal but a mistaken thought. The thought that we are somehow separated from God and need to “get” to Him, instead of knowing that we are already there—as His perfect idea and expression. Listening: Thank goodness listening to God’s voice isn’t dependent on human hearing, age, training, or any kind of medium. On the contrary, listening is a dynamic state of consciousness. It makes sense to devote more attention to listening to God than telling Him what we think He needs to attend to. I have found that the Christ—the activity of Truth, God, in action—speaks to me proportionately to my willingness to listen. But I need to calm my thought and completely silence all the obstacles that obstruct hearing God’s guidance. This “listening ear”—this capacity to listen—fills me with gratitude, helping me keep the focus on hearing—not hoping. 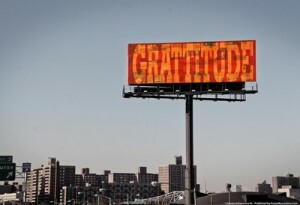 Gratitude is our prayerful acknowledgment that good is always present, available, and uninterrupted. Following: God’s guidance is a reward unto itself. Simply being grateful that we can follow His voice—this spiritual intuition blesses us and, in turn, blesses others. Since God is the master of all details, His guidance carries with it everything necessary to bring to fulfillment the right ideas He has given us. Knowing and cherishing this is adhering to gratitude now. I see gratitude as an attitude—my outlook on abundance, health, and happiness. The more gratitude I express, the more I see these Godlike attributes expressed all around me. “Dessert first” means I’m willing to see the underlying strength of God, good, in my life—indestructible, unrestricted, and incapable of being lost or diminished. So doesn’t it make sense to reward ourselves now, not later? We have permission from our Father-Mother God to begin with dessert. * Tom Taffel operates a group travel company in San Francisco, California.